I tried to get rid of my thoughts at quarter to three in the morning, but closing my eyes would not help me fall asleep again. Suddenly I remembered a line from a Croatian rock song I had listened to a couple of hours before: “Ne mogu zaspati” (I cannot fall asleep). 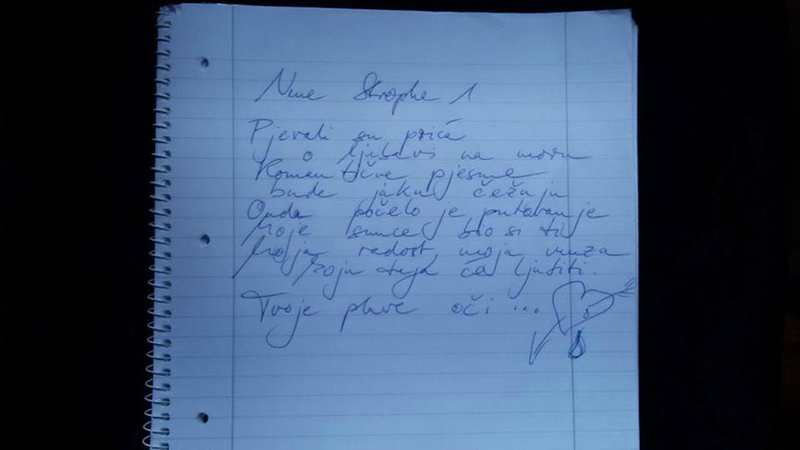 I switched on the light, took a pen and a piece of paper to write down my new first verse for track 6 from my latest EP The Muse – in Croatian language! It didn’t take long to search for the words. Seemingly the song lyrics had always been there expecting to be discovered. Not bad for a person who started exploring that kind of vocabulary only four months ago! Somehow it felt spooky and unreal. On Wednesday I almost believed in a dream. However, it was naked reality as I found a piece of handwritten evidence next to my bed. Happily I also remembered the booking of a trip to film the video for “Tvoje Plave Oči”. Since Tuesday evening it has been fixed and scheduled for June 2016, and for private reasons I will not reveal the settings to you! 😉 Just be sure that after the holiday I will release two new versions of the love song: one version completely in Croatian and “Your Blue Eyes” in English. Yesterday I’ve also made slight changes on the instrumental arrangement. It’s the first time for me to edit a song which has been released before. Maybe “Tvoje Plave Oči” is a story still waiting for its ending or perhaps I’m in love with its language. In fact, I can hardly wait to produce the video! I know I will look beautiful in it, but never as beautiful as the scenery to be featured in it. By the way, here’s the beginning of all this blue-eyed nocturnal inspiration: The Story Behind “Tvoje Plave Oči“ … Very sentimental, isn’t it? … is a story about unfulfilled longing and two people who liked each other too much when romance was forbidden. It would be unfair to tell you who this person was and under which circumstances we got in contact. We accidentally met during my summer holiday in Croatia. He also loved singing. In the evening before my departure he asked me to sing a duet. He had chosen “My Way“ from Frank Sinatra. Since we were not allowed to be together, the union of our voices turned out to be the highest level of togetherness we could ever experience. So we kept on singing. In our songs we finally touched very gently and tenderly. We looked at each other intensely. He had such a charming smile, sensual lips and sparkling blue eyes. How much did I want to hug and kiss him! At first I was wandering up and down the room, still hoping to see him again. A couple of minutes later I was almost determined to steal into his room and show him all the things my voice had merely insinuated. However, my courage had left me before I was able to start. Thus, I tried to sleep in vain. As far as I remember, I was crying a little. The pain of parting weighed heavily on my heart. Suddenly I received a very clear idea of a melody and the original German version of the song: “Deine Blauen Augen“ (“Your Blue Eyes“). In June I had a very poor knowledge of Croatian. “Hvala“ (thank you), “molim“ (please), “Dobro jutro“ (Good morning), “Dobar dan“ (Good afternoon) and “Dobra večer“ (Good evening) were the only things I could say in that language. I took my diary and a pen to scribble the lyrics while singing very low volume. My voice was mixed with tears anyway … Eventually I was calmed down by my own songwriting and fell asleep. A couple of hours later I returned to Berlin. It was cold and raining. So I locked myself in my cellar to arrange the song which was given to me in beautiful Croatia. After all I felt sad and creative at the same time. My vocal coach Snezana Nena Brzakovic translated my German lyrics. As she is from Serbia, I asked my Croatian fan Nina Čović to proofread the text. Nina changed a couple of words, then I went to the studio and recorded the track at the beginning of July.